Western Pacific No. 913, original photography by Joe Ercoli. 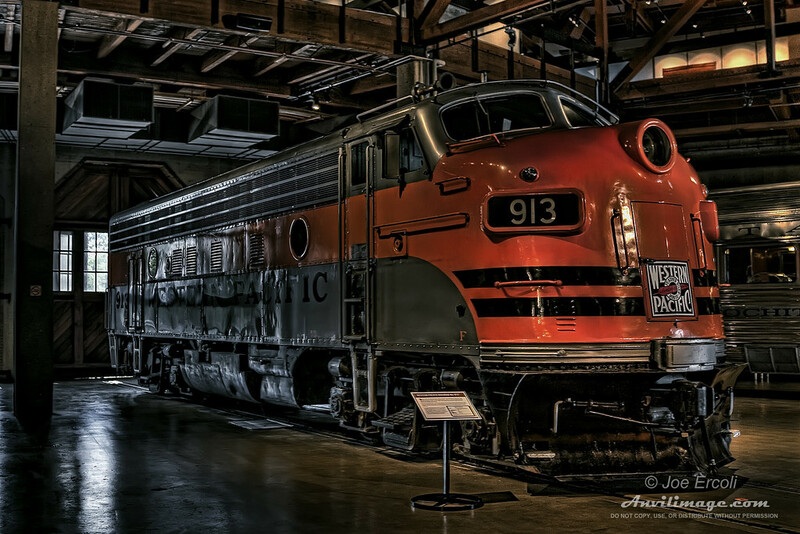 Anytime that anyone hears that I like trains, they always tell me, “Joe, you’ve got to go to the big train museum in Sacramento.” Even after hearing it several times and looking at the California State Railroad Museum’s website, I just didn’t get what the scale of that place is. It wasn’t just a couple engines or cars tucked into a warehouse somewhere, but a huge building dedicated to showcasing multiple car trains and engines from different generations. Much like my trip to the USS Hornet, I know there is more to see when I go back and I still walked away with quite a few pictures. The image above is but one of the many engines on display there that is still operational and sits just inside the doors to the roundhouse and the turntable outside. The Western Pacific Railroad No. 913 operated for 31 years, was donated to the museum in 1981 and has been restored to look brand-spankin’ new. This particular engine struck a chord with me because it reminded me so much of one of the first electric trains that I used to play with as a kid. I guess I’m like the others that told me about the museum, I just can’t find the words to describe the enormity of the collection and display. From the complete trains – engine to caboose – to the engines lined up at the roundhouse doors waiting to go out again, engines on tracks surrounded top and bottom by mirrors like a model in a display case to a complete train on an overhead trestle, the size of the collection is baffling yet intimate at the same time. While we’re safely held back from the tracks by crossing gates as they roar by, at the CSRM you can get up close and personal to all of the trains there. HDR Info: This HDR was shot hand held with a focal length of 24mm @ f4.0/ISO 320. Three exposures were combined with Photomatix Pro and further processed with Photoshop CS4. Complete Exif here. This entry was posted on Friday, June 5th, 2009 at 4:14 pm	and is filed under Blog, Photos. You can follow any responses to this entry through the RSS 2.0 feed.